Don’t make McNabb a scapegoat – Shanahan deserves some blame for Redskins’ disappointing season. 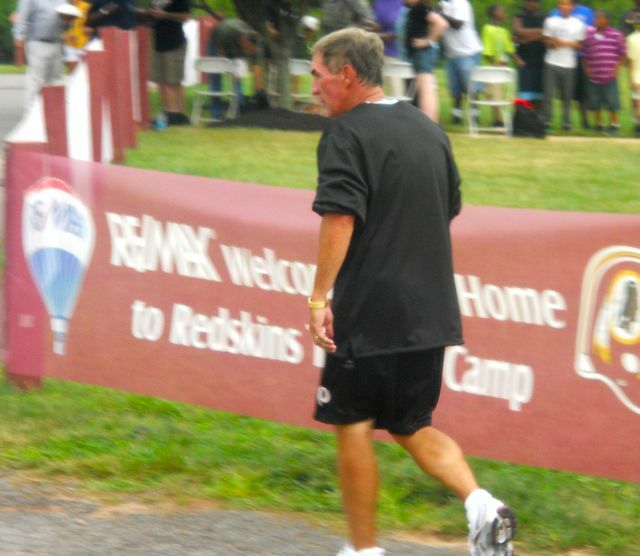 Redskins coach Mike Shanahan deserves some blame for Washington's 5-8 season. Photo by Mike Frandsen. Donovan McNabb deserves part of the blame for the Redskins’ disappointing season, but Washington could have been successful with the six-time Pro Bowl quarterback if coach Mike Shanahan had made better personnel and coaching decisions. Shanahan benched McNabb for the final three games of the year Friday. If the Redskins had avoided a few disastrous mistakes, McNabb could have led the Redskins to a respectable season this year. In that scenario, McNabb could have continued to start next season while a rookie quarterback drafted in 2011 would have been groomed a year before starting. Now the Redskins will play Rex Grossman or acquire a veteran next year to hold the fort down anyway before a draft pick starts. McNabb didn’t perform up to expectations, with 14 touchdowns and 15 interceptions, but he didn’t have much help, and he shouldn’t be made the scapegoat for the Redskins’ problems. To see how the Redskins could have won with McNabb at the helm, and which mistakes could have been avoided, click here for my article on Examiner.com. This entry was posted on December 19, 2010 at 2:44 pm and is filed under Uncategorized. You can follow any responses to this entry through the RSS 2.0 feed. Both comments and pings are currently closed.